The Mokelumne Aqueduct is owned and operated by the East Bay Municipal Utility District (EBMUD), which supplies water to 1.4 million people and 35 municipalities in the East Bay, including Oakland, Berkeley, Richmond, and parts of Alameda and Contra Costa County. East Bay Municipal Utility District (EBMUD) was established in 1923, acquiring rights to the Mokelumne River in 1924. Bonds to build the water system were approved later that year with construction beginning in earnest in 1926. By 1929, water from the Mokelumne River reached the East Bay for the first time. Growth after World War II led to a second pipeline for the aqueduct in 1949, and yet another in 1963. EBMUD holds rights to 364,000 acre-feet per year, which represents about 90% of the district’s water supply sources with the remainder coming from local supplies. 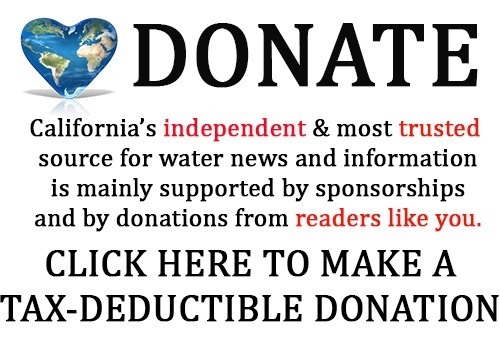 However, EBMUD’s ability to divert that amount of water depends on numerous factors, including the interrelationship between EBMUD”s water rights and other diverters, the ability to store water, and the amount of runoff available as well as several lawsuits, negotiated settlements and State Water Board decisions. The Mokelumne River is 95 miles long, flowing west from Highland Peak high in the central Sierra Nevada down in the Central Valley and ultimately into the Sacramento-San Joaquin Delta. The river is divided into the Upper Mokelumne River, stretching from the headwaters to Pardee Reservoir, and the Lower Mokelumne RIver, which refers to the portion below Comanche Reservoir. Most of the 627-square mile watershed of the Upper Mokelumne River is undeveloped with 75% being forested lands in the Eldorado and Stanislaus national forests. The Lower Mokelumne River is used primarily for irrigation. 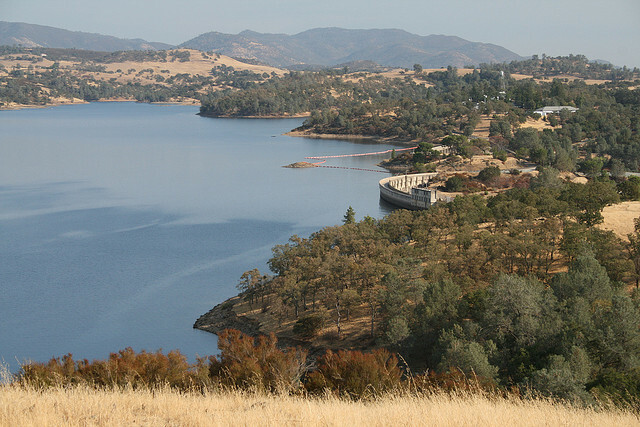 Pardee Dam and Reservoir, located 38 miles northeast of Stockton, serves as the collecting point for Mokelumne River to enter EBMUD’s system. Pardee Dam is a concrete gravity arch structure built in 1929 that is 345 feet high with a capacity of 198,000 AF. Water from Pardee is used principally for EBMUD’s municipal water supply as well as a supply source for Jackson Valley Irrigation District. Water from Pardee Reservoir enters EBMUD’s system through the 2.2 mile Pardee Tunnel and then into the 82-mile three-barreled Mokelumne Aqueduct to cross the foothills and the Central Valley where at Lodi, the aqueduct joins up with the Folsom South Canal. 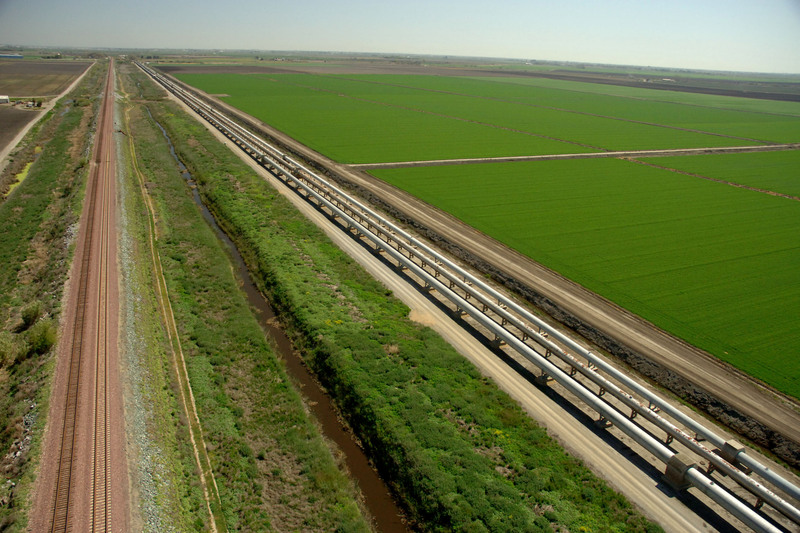 The aqueduct then continues across the Delta to Walnut Creek, where the water is sent to either one of three of the EBMUD’s filtration plants or to terminal reservoirs. It takes 30 to 45 hours for the water to reach the East Bay from Pardee Reservoir. The Mokelumne Aqueduct crossing the Delta. Water not diverted into EBMUD’s system or stored at Pardee flows ten miles downstream to Comanche Reservoir. Constructed in 1964, Comanche Dam is a earthen dam impounding 417,120 acre-feet of water. Although not connected directly to the aqueduct, water from Comanche Reservoir is used to maintain downstream obligations, such as stream flow regulation, water for fisheries and habitat, and downstream diverters – requirements which would otherwise increase the demand for water stored at Pardee Reservoir and reduce the supply available for EMBUD customers. Like the Hetch Hetchy Aqueduct, the Mokelumne Aqueduct diverts water from the river before it has a chance to flow into the Delta, instead transporting it across in steel pipes to the East Bay. EBMUD holds water rights to about 364,000 AF of water, enough to satisfy demands in normal years. However, during dry years, EBMUD can be restricted from using its full entitlement due to water use by priority water right holders and downstream obligations, as well as variability in rainfall and runoff. With EBMUD dependent on the Mokelumne River for 90% of the its supply, the district simply cannot meet customer demands during droughts, even with steep rationing. After a decades-long dispute between EBMUD and the Sacramento County Water Agency (SCWA) that centered on EBMUD’s contractual right to take water from the American River for use in the East Bay and the desire of Sacramento interests to preserve the American River waterway, the two agencies joined together to form the Freeport Regional Water Authority to implement a joint diversion to supply surface water from the Sacramento River to customers in the Sacramento area, as well as provide a supplemental dry year supply to the East Bay. The facility broke ground in May of 2007 and was completed in 2011. During dry years, EBMUD is entitled to access up to 100 million gallons per day to augment its Mokelumne River supply and its water conservation programs. 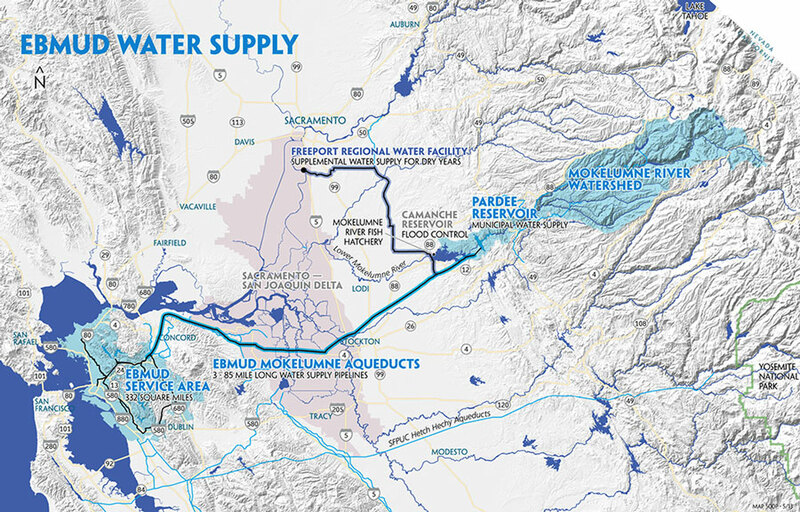 Water from the Freeport diversion is conveyed through a pipeline to the Folsom South Canal and ultimately into EBMUD’s Mokelumne Aqueduct to be conveyed to EBMUD’s service area. Water from the facility also supplements groundwater supplies for 35,000 Sacramentans served by SCWA. In 2014, EBMUD accessed the water for the first time since the project was completed with the Board authorizing the purchase of 5 billion gallons of water, or about 16,000 AF. “This is significant. In the past, without the access to Freeport water EBMUD would be looking at mandatory rationing, but because we have Freeport, that’s not an option we had to consider,” Andy Katz, president of the EBMUD Board of Directors, told KTVU News. Click here to visit East Bay Municipal Utility District online. Click here for the Wikipedia page on the Mokelumne Aqueduct. Click here for Freeport Regional Water Authority webpage for more information about the Freeport facility. The photos and diagrams in the gallery are all sourced from public domain sources, so feel free to use as needed. This page was written by Chris “Maven” Austin on July 5, 2015.